Gordon has performed his show thousands of times under many different conditions. From standing on a picnic table surrounded by hundreds of kids at a company picnic, in a bowling alley next to live bowlers, to out of doors house parties with neighbors mowing their lawns, on both sides. Although he puts his best into every show, distractions outside his control can diminish the entertainment value. The tips below help turn your performance from good show into a GREAT SHOW! Gordon is not competing with the neighbor’s lawn mower, the ice cream truck, bumble bees, and moonwalk blowers. Yes, Gordon will do his shows out of doors, but please let him know ahead of time so he will have time to set up his sound system. Turn off any music and televisions (the Detroit Lions are going to lose anyways). Tell guests that this the “Show Room” (the “Talking Room” is down the hall). It is best NOT to serve any food or beverages during the show. The kids will need their hands free to clap, and raise to become volunteers. It is no fun for a kid to spill their drink in their lap during the show. The more light the better, this will help the audience see the show, and help with your photos and videos. Not only is it allowed, but Gordon encourages it! Make sure your batteries are charged. Things like helium balloons, whistles, horns, clappers, etc. can be noisy. Gordon is getting “old and crotchety.” DO NOT hand these items out until Gordon has left the party. For example, helium balloons will often pop, and can block the view of audience members. Consider where Gordon will be doing his show. Most often kids will sit on the floor in front of Gordon. Please make sure there is room. It is much easier to rearrange the tables before the guests have arrived. Often moving a “10 top table” that is right in front of the performance area will do the trick. If kids will be sitting on the floor, start the first row of tables at least 12 feet from the stage area. Though it’s always fun for Gordon to perform his show on a stage, a stage is not necessary. 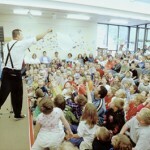 Gordon has performed his show successfully for over 500 kids, flat on the floor of a gym. If you have a group of 150 or more, a stage or riser or will enhance the performance. It ensures that all audience members will be able to see the show and gives the kids a clear line where to sit. If no stage or riser is available, use a roll of masking tape to mark off the front of the “stage” so no one sits on it.